Build 3017 is now live on the Dev Channel, with the full changelog posted on the update center. The primary focus of this release was continued improvements to the River device, with special focus on making the UI and controls more intuitive to use. Although still certainly not perfect, this release is a major step forward. Of course, there are several additional very useful changes in 3017, including the life-saving “Estimate build time” command in the World Setup dialog, but the focus was on the River device. 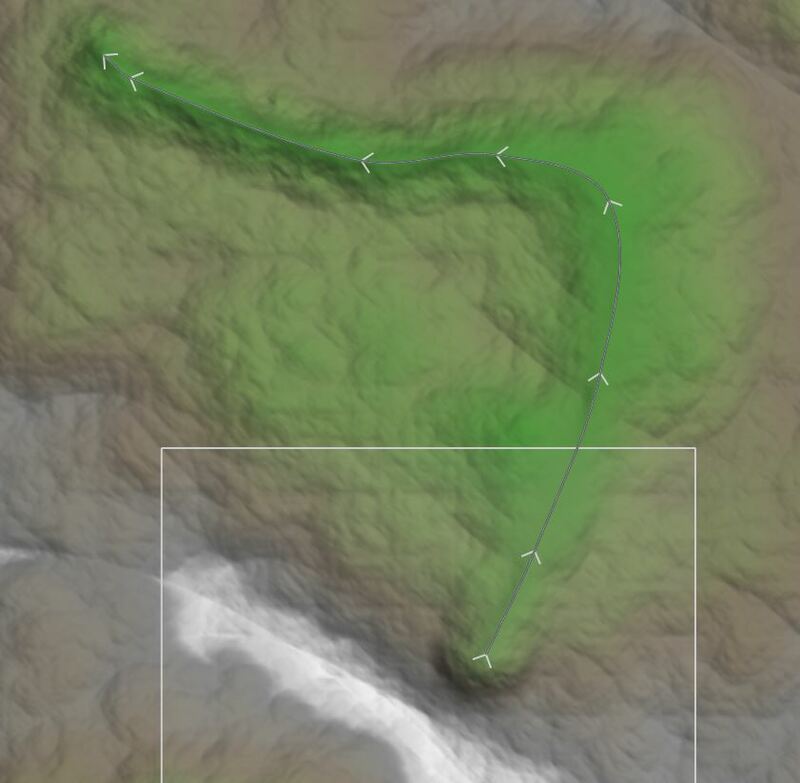 The first thing you’ll notice is that the rivers are displayed more intuitively; the flow direction is indicated by chevrons on the path, including marching flow direction if you don’t have a GCS overlay selected. And although it’s hard to show in a static image, the behavior and defaults are now much closer to what an artist might expect, while still preserving the specificity that was possible before. Which may not be especially pretty, but is probably a much closer match to what you were hoping to produce than the previous versions! The reach valley walls are now improved and include both a fractal breakup and also control of the valley shape, allowing you to achieve both U and V shaped valleys. The behavior of child reaches is improved, both in the display blending between them and also the way they get their elevations from both the terrain and their parent. There are still some issues with the River device, and it is currently flagged “Experimental” within WM, a new status for 3017 and beyond. Experimental devices are those that have notable issues that remain to be resolved, or expect to have their interface changed, but are too powerful to let them not be included. I don’t know about you, but that’s pretty compelling to me! Lastly, I wanted to mention that this release is also going to lead into a major milestone — All of the features of the Dev build are going to be synced to the Release build soon. Compared to WM 2.3.7, The current dev build is incredibly feature rich and advanced by this point. It was never intended to get quite so far ahead in the first place. A variety of circumstances conspired including an unclear conception and policy on my part on deciding how perfect a feature needed to be to be Release-channel-worthy. The result, among others, has been that new users of World Machine have been completely kept in the dark about all of the advancements over the last several years until they by chance read about or try the Dev channel. There’s a lot more I could say about updating the release channel but I’ll keep this short for now. Briefly, the next steps are going through reviewing, packaging, and revising examples, macros, and blueprints for all of the new features in preparation for updating the Release channel (including the Basic Edition). This shouldn’t take long.. keep your eyes peeled in the immediate future! Previous PostBuild 3016Next PostBuild 3018.. What’s in a Name? 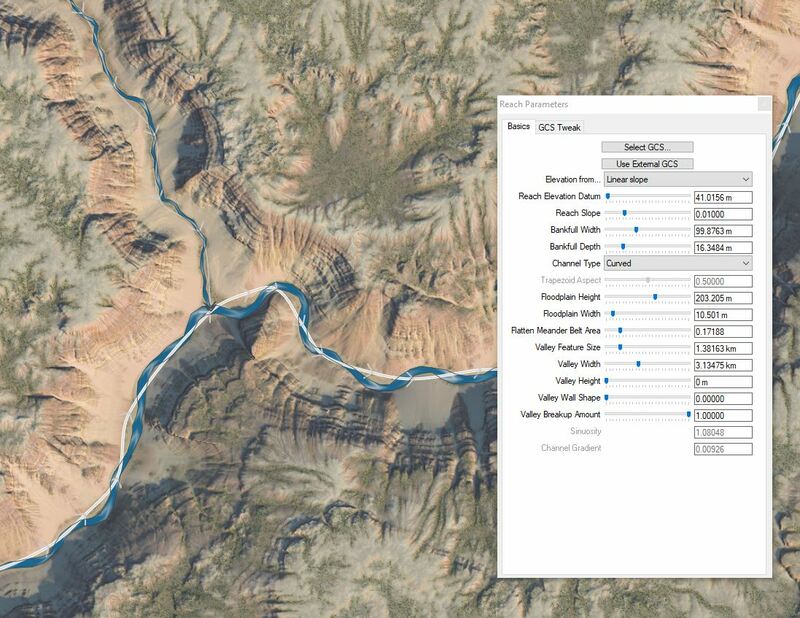 Just tried out the new river reach options in layout view and it was easy to get some different looks to the river. One question: what’s the difference between curved and trapezoidal channel types? I took screenshots of heightmaps built using each type but they looked identical. The trapezoidal riverbed gives a channel that looks like this : \__/ , with the steepness of the walls controlled by the Trapezoidal Aspect parameter: you can get anything from straight up and down walls to a triangular bed. The curved type has a more natural and typical parabolic-type curve to its bottom; additionally, the deepest point of the river, called the Thalweg, moves laterally in the channel in response to the GCS that is assigned to the river. 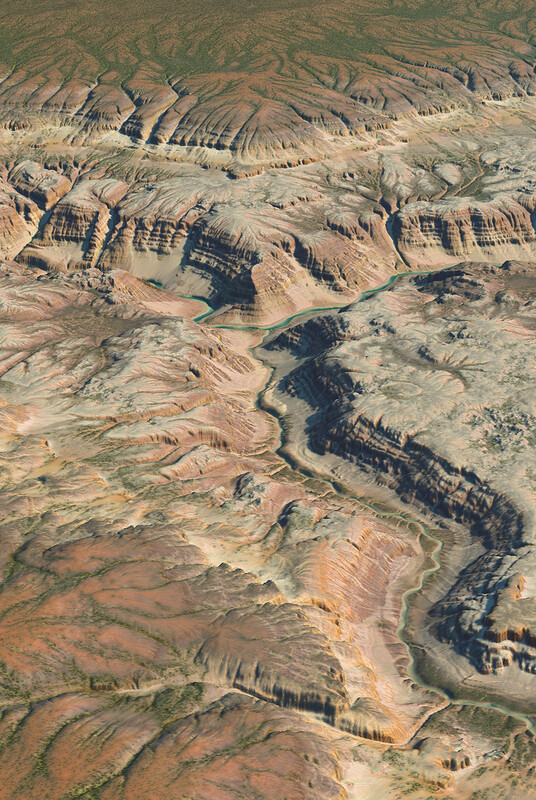 For example, the deepest part of the river around the meander bends is at the outside of each bend. But you’ll only see this behavior once you’ve assigned a GCS to the river. Wonderful to see, I’ll try it first thing tomorrow! So are you releasing WM 3.0 final soon?